Regional kitchen is composed of meal kinds generally cooked from floury products. Layered pastry, pastry with marrow, bazlama, cizleme, pancake, komec bread, pita bread types, tarhana soup, ugmac soup, goce soup, malayi can be mentioned among regional meals. Eregli flat bread and Ottoman's strawberry, Caycuma yoghurt, Devrek bun and simit as well as lamb chestnut which grows in the forests of Zonguldak are the meals which become identical with the name of the region. The local food varieties of the Sinop kitchen are; Nohul (with grapes - walnut - mince meat - yoghurt), Katlama Pilaki (food of Hidirellez), Corn Pastry, Kasik Cikartmasi (mamalika), Keskek Meal, Stuffed Anchovy, Quince and Chestnut Meal, Ear Dough (ground meat dumplings boiled and covered with yoghurt and garlic sauce), Islama, Corn Soup, Corn Tarhana, Eggplant with vinegar and Leek with vinegar. Kuymak which is prepared by a sort of milk called Agarti, is the regional dish of the Artvin cuisine. Some of the examples for pastry are hinkel, cergebas, katmer (flaky pastry); pusuruk can be counted as a traditional soup, whereas, cilbir (poached eggs d’orsay with yoghurt and melted butter), kaygana, corn bread with anchovy, anchovy preserved in brine, are among the other traditional dishes. Main sweets of the province are hasuta, kaysefe, zurbiyet, and honey delight. The multi varied and delicious Bartin meals are majorly composed of meals with meat, vegetable, milk, pastry and meals cooked with olive oil. These meals are accompanied with pilaf, soup and desert varieties. Over one hunderd varieties of dishes in the Bartin kitchen indicates the richness of the regional cuisine. Corn, cabbage and grained beans take many places in Samsun's cooking style. 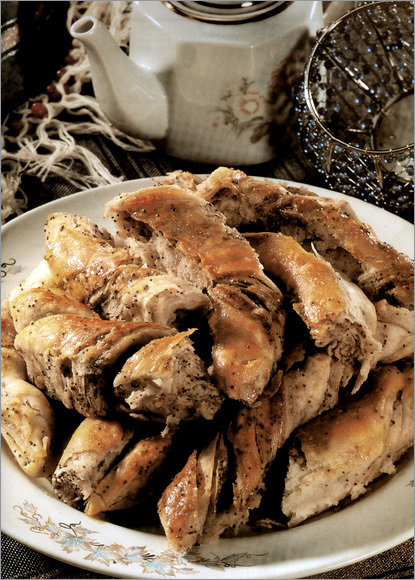 Goose, chicken, duck and similar poultry take important place in traditional nourishment. Tir (Goose enveloped in dough), ground beet (Yazi beet), corn soup, yoghurt soup, cracked wheat cooked with lentil, black cabbage soup, bread with anchovy, rice with anchovy and Kocakari Gerdani (shredded wheat dessert) can be mentioned as local dishes of the city. Every Sunday, it is common to bake bread with pastrami or meat in Kastamonu. Among the local food varieties, tarhana soup (sun dried curd, tomatoes and flour soup), ana - kiz soup (mother - daughter soup) , ecevit soup, grilled cutlet, miklama, kapatma, fried meat, home made fettuccini, slave dough, banduma, kaygana, cirik, biryan kebab, meat pastry, halucka, simit tiriti, corn bun, baklava, spoon halvah, flour halvah with grape molasses, cekme halvah are the most preferred meals and deserts of the region. Collard and anchovy are remembered when Giresun is in question. Some of the meals are; Black cabbage soup, black cabbage dible, nettle puree, corn bread, bean pickles, cherry salting and pezik mıhlama. 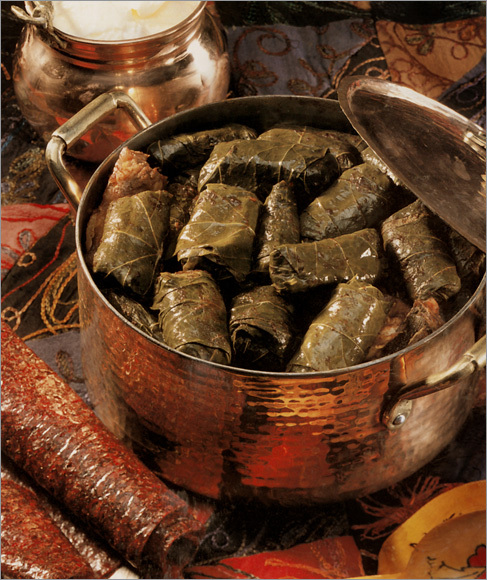 The important dishes of Ordu are, beet soup, wrapped beet, Melocan braise, sakarca mihlamasi, galdirik braise, mutton or chicken and coarsely ground meat, corn bread, pickle braise, pasta with cheese and parsley filling, fried anchovy, steamed anchovy, fried anchovy stuffing and other fish dishes. 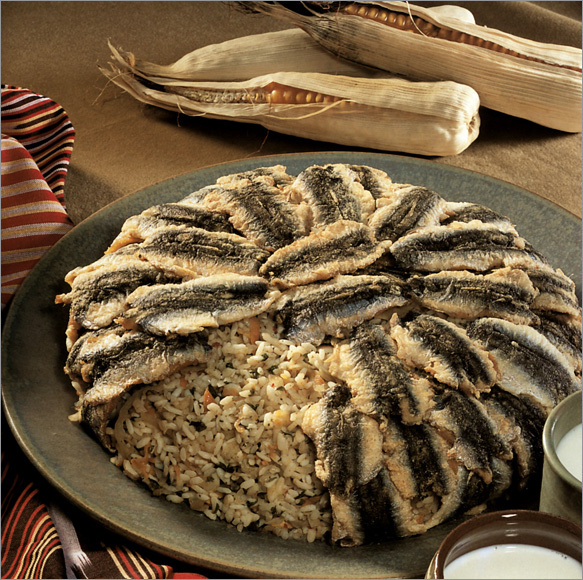 One of the most common ingredients of the region is anchovy, which is found in many dishes like anchovy pilaf, anchovy omelet (kaygana), and fried anchovy. Other regional dishes include cabbage braise, halva with cream, fresh cheese and walnuts (hosmerim), Akcaabat meatballs, Trabzon flat bread with ground meat and cheese, and Hamsikoy rice pudding. At Düzce, local meals are Albanian pastry, Sil pastry, Gobete and boiled dumplings covered with yoghurt and garlic sauce (manti), Katlama, Sari Burma, pasta with cheese and parsley filling, Bosnian pastry, Bosnian dessert, pan fried filo pastries with various fillings, chicken and coarsely ground meat, Lepsi, Mamursa, black cabbage meal and corn flour bread. Regional food is served at the restaurants in Safranbolu district of Karabuk province. Gozleme (pancake), kuyu kebab (well kebab), yayim macaroni, pasta with cheese and parsley filling and house made baklava are the local foods and desert varieties. Hazelnut, pistachio, rose and saffron flavored Safranbolu delights which are always sold as fresh are as famous as Safranbolu houses. Region specific saffron is sold in the spice-sellers. Some of the local meal varieties of Bayburt are; String halva, sweet soup, galacos, sour cabbage, curd stuffed with vegetables and fake stuffed vegetable. Gumushane kitchen is rich and traditional. Gumushane Mantisi (boiled dumplings covered with yoghurt and garlic sauce), rosehip soup, zuluflu soup, un herlesi soup, gavut soup, pagla denlisi, borani, fit fit hasili, potato braise, muhla, yergok stuffed vegetables, milky hasil, curd stuffed with vegetables, bread meal, citma beans, kaygana, siron, home made fettuccini, lemis, eristi sweet, hasude kuymagi, black halva, burma, lalanga are some of the well known dishes. Amasya has a rich cooking tradition. Catal corba (Knife soup), (soup), kesme ibik soup, toyga soup, cilbir, staffed broad bean, hengel (kind of meat pasty), pancar (beet with preserve of dried meat), vinegar flavored liver, yuka sweet, envelope kadayifi, halbur cookie, wild apricot gallesi, bread with black cherry (Amasya shortbread), sini paste with cheese and parsley filling (Amasya type) and Yakasal pastry can be counted as meals special to locality. Furthermore, Amasya is famous with its apple. The famous deserts of Bolu Province could be counted as hazelnut candies, chocolate, pine honey, cream and butter. The Kabakli gozleme (marrow pancake) is the local pastry. The palace halva and froth halva of Mudurnu District, the candy bean of Goynuk District, apple and grape of Seben District and the cheese of Mengen District are worth tasting. Besides, Mengen district is famous with its cooks. The cabbage and anchovy hold a special place in the region. Main meal varieties could be counted as; Ayran dogramasi, cilbir, cirihta, cirmulis, anchovy pilaf, bread with anchovy, fried anchovy, herse, hosme, cabbage soup, minci, mihlama, ormanli anchovy, paluze, papara pasmanika, pumpkin with molasses, and cabbage wrapping. The apiculture is executed at the plateaus and meadow areas. As the chemical materials could not reach to this locality and as the production is supported by flower variety and other advantages, the "Anzer Honey" produced in the region is famous worldwide.